These are all classified as hook knives and are made by Mora of Sweden who have been producing quality steel for well over 100 years. They all have carbon steel blades - designed for better edge retention - and simple, tactile, ergonomic, oiled birchwood (Betula pendula) handles. 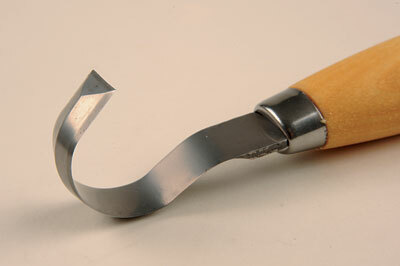 The tangs of all three run the length of the handle for added strength. 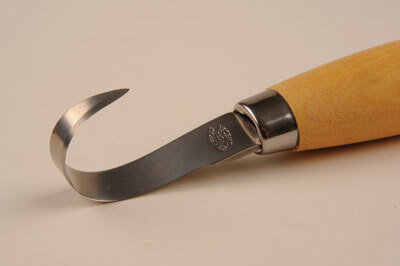 Model 162 is double-edged with a blade length of 50mm and an internal radius of 15mm. 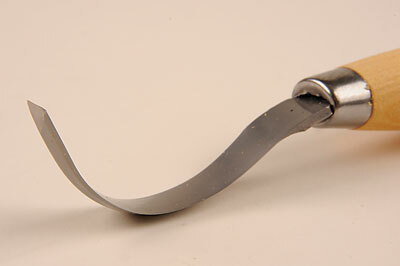 Model 163 is, again, double-edged but with a slightly longer, 60mm blade and a larger 25mm internal radius. Model 164 is single-edged with a narrower 50mm blade and a tighter, 12mm internal radius. The double-edged blades are suited to right- or left-handed use and pull or push cuts, whereas the single-edged is designed for right-handed pull cuts or left-handed push cuts. The overall length of all these knives is between 160-170mm. None come with any form of blade protection. As with many tools, these knives needed sharpening before use. The curved blades are relatively easy - even for the inexperienced user - to sharpen/hone or strop because the bevel is on the outside. Once sharp, they hold their edge well. I roughly carved a small spoon and used these knives to carve the bowl. Having never used such knives before, I struggled with all three knives to get the grip right, but perseverance paid off and I was soon able to make nice cuts with-the-grain using the single-edged blade. Cuts against-the-grain I found tricky; I suspect more experience and better technique would make things easier. I found using the double-edged blades difficult because, depending on whether I needed to push or pull, I always wanted to apply pressure with my thumb or forefinger on the back edge of the blade. These knives have edges on both sides of the blade, so are not to be held that way. Experience and practice will have an effect on how you grip them. 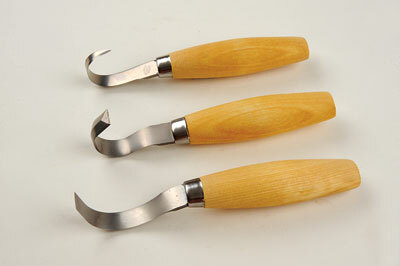 These are specialist knives aimed at people who wish to create spoons, bowl forms and other curved faces. Being new to this, it took me a little while to get used to them. Model 164 was my favourite and of the other two, you must make the choice of what radius to use according to the work you will undertake. They represent good value for money.